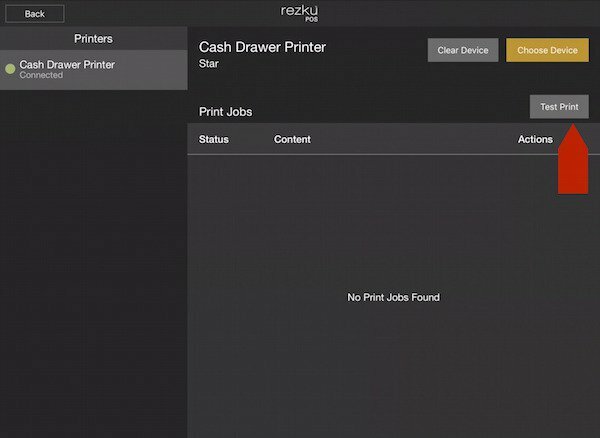 To use a cash drawer and receipt printer with Rezku POS, first make sure your network is setup and configured properly. NOTE: This guide is for wired receipt printers. 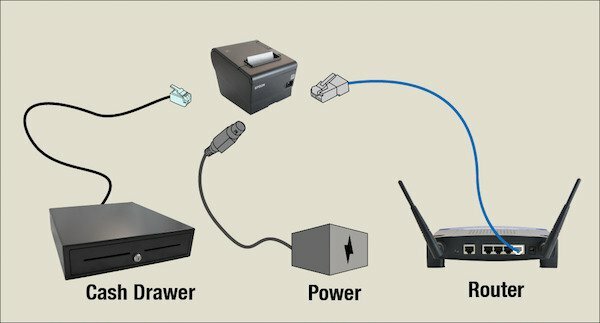 Make the physical connections between your cash drawer, receipt printer, network and power. Your specific hardware may vary, but the steps will be the same. Plug the drawer into the the printer. Plug in the power cable that came with the printer. Ensure that the network is working and connect a network cable between the Cash Drawer Printer and the router. To help you make the proper connections, find your printer model in the Rezku POS Printer Hardware guide, available from Guest Innovations. The cash drawer will have a cable coming out of it that resembles a telephone plug. The receipt printer will have a connection for this cable, on the back or the bottom. There may be an icon of a drawer beside it. From the New Order screen tap on the gear icon in the top right corner to access Settings. 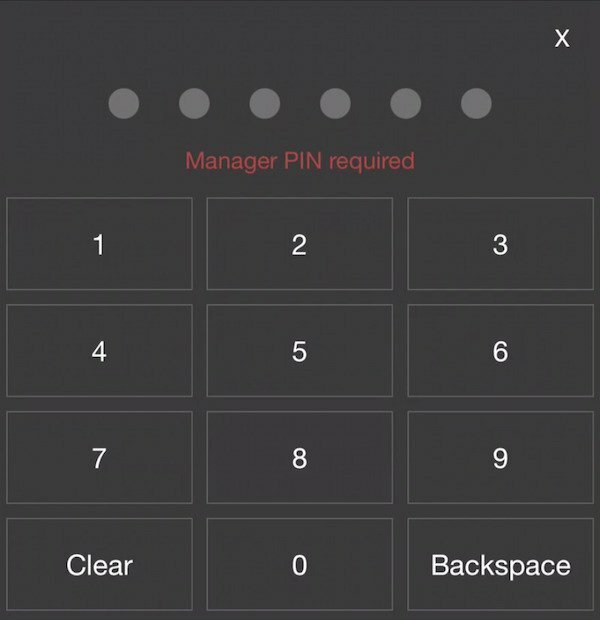 The default permissions requires a manager’s PIN to access Settings. You will enter the Printer Configuration page. By default you will always have Cash Drawer Printer in the list to the left. You can also add chit printers for the Bar, Kitchen or other areas of the restaurant in the Printer Settings area of Back Office, but that is not part of this guide. If you are interested in using a chit printer, contact Guest Innovations for the Chit Printer Setup document. 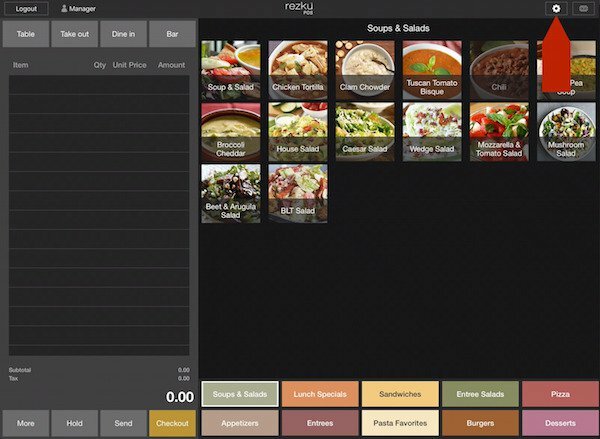 To add a cash drawer printer to a register, tap Choose Device. The Choose Printer window appears and automatically lists the name of any compatible receipt printers on the network. 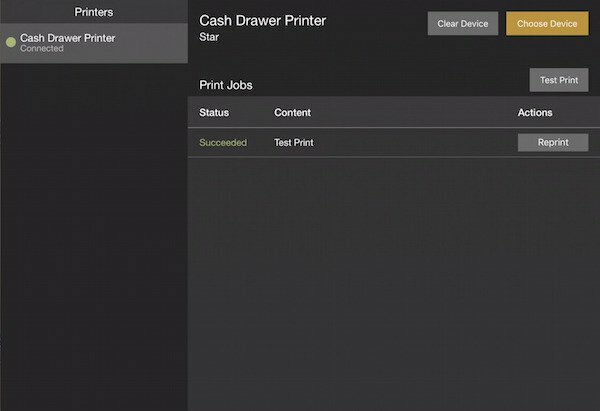 NOTE: The list of available printers will depend on what model(s) and how many receipt printers you have connected to the network. 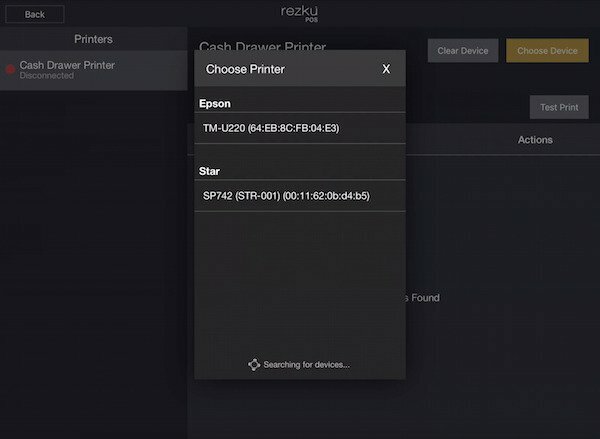 Rezku POS shows you the manufacturer and model name and MAC address of the available printers to help you identify which one to connect to. If you’ve connected multiple unassigned printers and you aren’t sure which one to connect to, print a self-test from each printer and take note of the MAC address. Each printer has a unique MAC address that shows up next to the printer name in search. For instructions on printing a self test, find your printer in the Printer Hardware document available from Guest Innovations. 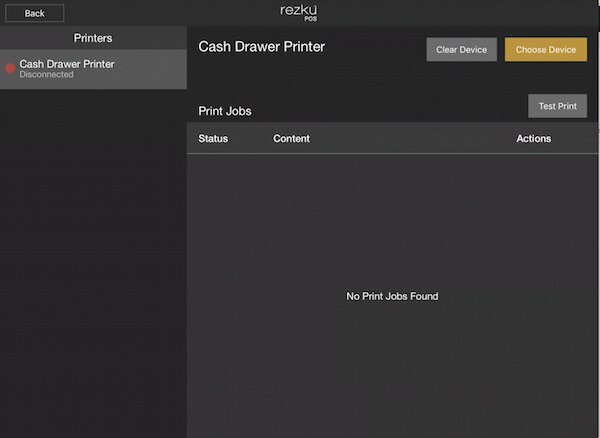 Rezku POS tells you if a printer is already being used, by showing the name of the register it is in use by. To connect to a receipt printer assigned to another register anyway, tap the printer name. If you tap Use Anyway, you will connect to the in-use printer. To share a printer tap the “More” button. Toggle the slider to turn on printer sharing and tap the share button. There are no restrictions on printer sharing, however, the printer can only print one job at a time and has no buffer. You may experience print failures if too many things are printed at once. For best results we recommend no more than 2 printer assignments per printer. 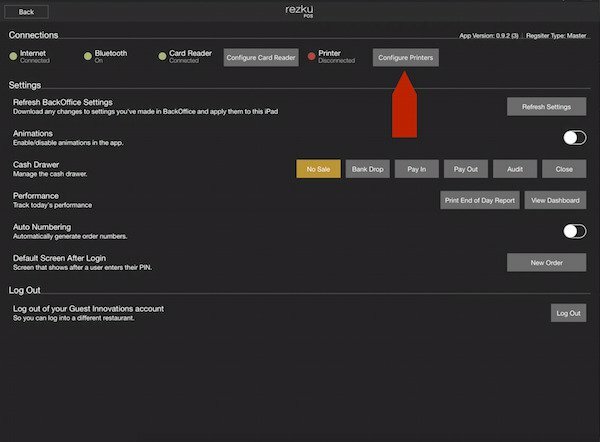 Tap the name of the printer you want to connect to, and the Cash Drawer Printer Indicator will turn from red to green. Once the Cash Drawer Printer is connected the indicator turns from red to green. Perform a test print to confirm that everything is working. Your printer should output a small receipt with test text on it. Also, you’ll see a notice for a successfully completed test print in the the Print Jobs queue. 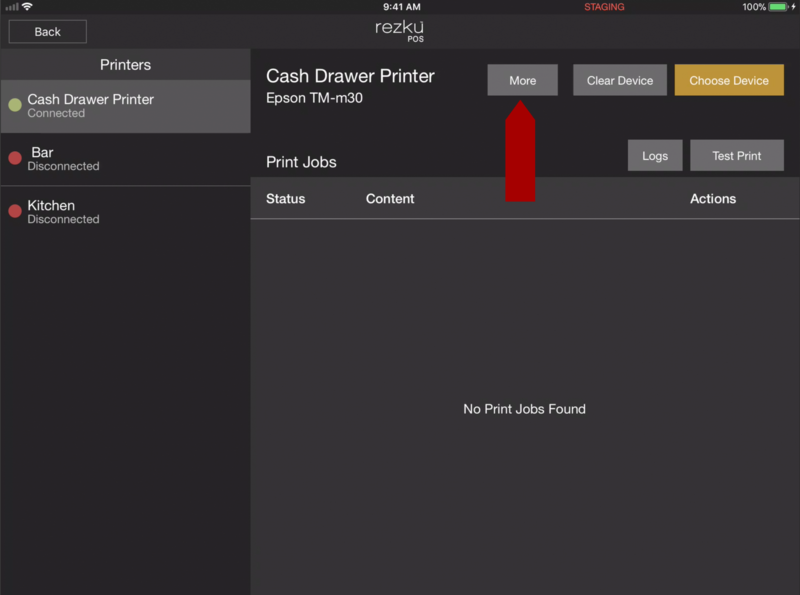 If your test print was successful then you printers is properly configured in Rezku POS! If the test print failed or you encountered an issue during setup, confirm all connections, review network settings and check your printer hardware. If you get stuck, feel free to contact the helpful, friendly Rezku Support team!